Know your mark, their weaknesses and strengths--both will show how to best bypass their defenses. 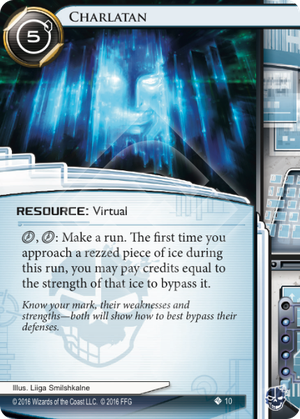 Can the Runner use Charlatan to bypass a piece of ice after the Corp rezzes it? No. “When approached” abilities meet their trigger condition at step 2 of a run when the approach begins, but the Corp does not rez approached ice until step 2.3 of the run. Charlatan’s ability creates a conditional ability that only meets its trigger condition the first time the runner approaches an already rezzed piece of ice. At first sight Charlatan seems to be powerful but it has many little downsides that all add up to make it less than impressive. First of all, 5 is pretty high for a resource, that's Professional Contacts level. The investment is significant, especially with how credit hungry criminal breakers can be. Once it's installed the activation cost is . That's reasonable. But because it triggers a run you cannot use Charlatan with run events such as Legwork and Account Siphon. But those tend to be exactly the runs that matter most. The bypass ability only works on the first rezzed piece of ice. That means Charlatan has the same problem as Inside Job: the corp can just install a gearcheck as the new outermost piece of ice to keep the heavy ice from being bypassed. Cost 13. No ice with this cost. For the 0-5 cost ice, the by far most common category, Charlatan takes roughly as much to bypass the ice as for the corp to rez it. At higher cost levels this changes but expensive ice is rare. Aside from giving me an opportunity to practice my spreadsheet-fu this little diversion into numbers tells us something important: even if Charlatan works on the right piece of ice it still costs a lot to get around that ice. Charlatan doesn't work on unrezzed ice so it's only something that's useful for rezzed ice that's also the outermost piece of rezzed ice and who's strength is significantly less than the cost your normal breakers need to break it. Still, there feels there could be a role for Charlatan in the early game, when you don't have all your breakers out yet and the corp has only one piece of ice in front of HQ. The install cost of 5 makes that less than attractive though, that's a heavy investment in a stage of the game where you typically don't have huge amounts of money. All in all I'm not impressed. But perhaps some criminal entrepreneurs see potential that I've missed.